One of peoples favorite Toy Car, introduced in 2007, the Honda Civic Type R FD2, it is a common 4 door Civic sedan that's been dressed up and tuned into a super Civic, it adopts the light weight modification technique that includes, exclusive suspension that is specially tuned with ABS/EBD system, Honda Civic Type R has an 18 inch mags with 17 inch front disc brakes. One of the biggest factor of its modification is the aerodynamic parts like the exclusive hood and fenders making this car grip better on the road. Other modifications made for this car includes the sports shift short stroke, metal pedals, an exclusive Honda R spec seats, the type R red emblem, and the exclusive Honda Type R Steering wheel. Honda Civic Type R is made with a specially tuned 2.0 liter K20A i-VTEC engine, its intake and exhaust also been tuned making this car produce a 225 horsepower with a 159 lb ft of torque, and equipped with a close ratio 6 speed transmission, this car can accelerate from 0 to 100 kmph in just 6.3 seconds and reaches a top speed of 240 kmph. 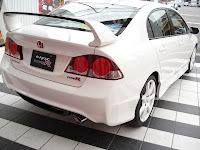 The Japanese market Civic Type R (FD2) went on sale on March 30, 2007. For the first time, the JDM Civic was sold as a four door sedan rather than a three door hatchback. Using the Japanese market four-door sedan as a base model meaning the new Type R is now bigger, wider and heavier.